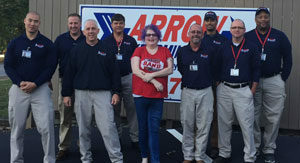 Based in Atlanta, Ga., Arrow Exterminators has opened a new service center in Milton, Ga., to better serve the Milton community in Metro Atlanta’s fast-growing northern suburbs. The new service center will help accommodate recent growth and provide career advancement opportunities for Arrow team members. Tim Pollard, senior executive vice president and COO, reports that the new facility joins Arrow’s growing list of 114 service centers throughout the United States.